We had the opportunity to taste Singapore's much raved about cupcakes last month when a friend from work had a week-long vacation there and agreed to buy us a dozen. Having tasted cupcakes from most of the front runners of the cupcake industry in the Philippines, I was certainly all giddy and excited to sample cupcakes from another country! I've learned that Twelve Cupcakes is a business founded by Singaporean celebrity husband-and-wife Daniel Ong and Jamie Teo. According to some interviews, the couple named their store as such because Daniel used to be a bowler, and in bowling, 12 strikes constitutes a perfect game. Also, according to Jamie, it is because there are 12 holes in a standard baking tray. Since we're not in the physical store, Charm, Ian and I each picked 4 flavors from their website so we could try a variety of their offerings. They also have specials that are only available on specific months and specific days. So be sure to check those out. My choices were Red Velvet, PB Chocolate, Strawberry Chocolate and Vanilla Chocolate. Of course, I also tried Ian's picks. This is definitely our favorite out of all the dozen. Though it tastes more like strawberry ice cream than fruity (I've always found strawberries more on the sour side), it's sweet and delicious and very much enjoyable to eat. The frosting totally complements the vanilla cupcake base so it's just the right balance. The strawberry frosting was the star of the show! 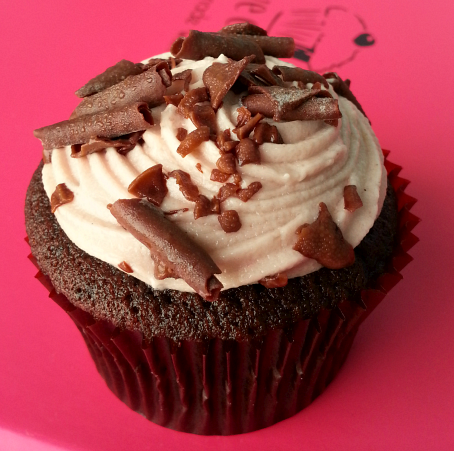 The frosting was very rich and very dense and it was the exact same taste of Reese's Peanut Butter Cups. 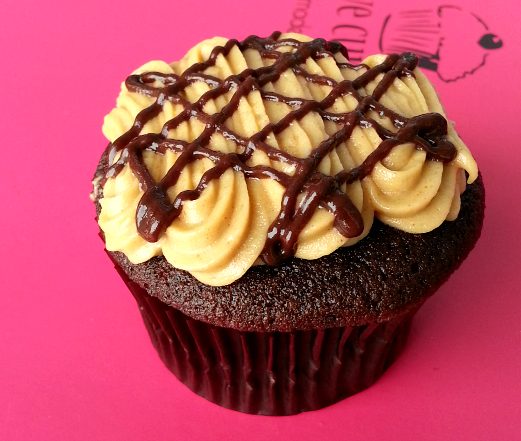 I thought it was a bit too much for me though, the dense peanut butter frosting on top of the chocolatey-ness of the cupcake. 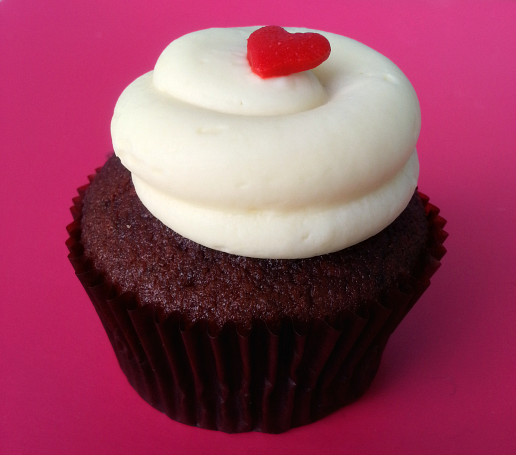 I've read online and heard stories from friends in Singapore that Twelve Cupcake's Red Velvet is surely one of the best out there. So I really had high expectations. Sure, the cupcake base was indeed moist and fluffy and great but it just tastes okay to me. 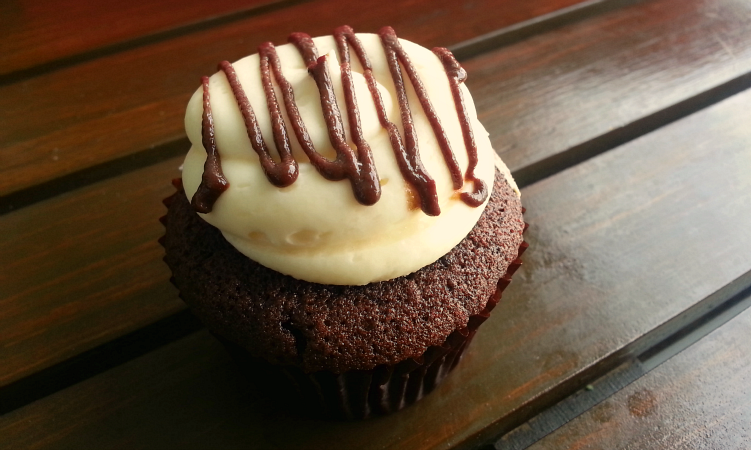 I thought there wasn't anything that makes it stand out from all other red velvet cupcakes I've tasted. It's good but not exceptionally good. The chocolate counterpart of our favorite, Strawberry Vanilla. 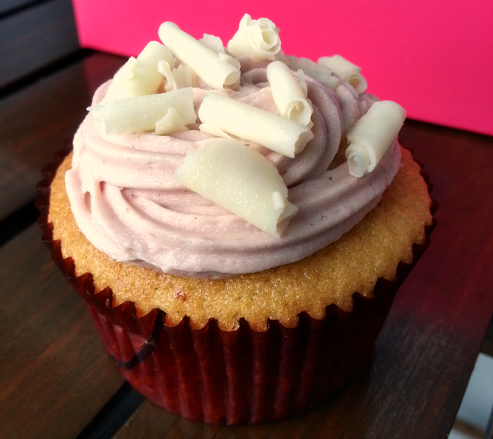 We still think the delicious and creamy strawberry frosting works best with the vanilla cupcake base. We all know that vanilla's taste is a bit muted so it was perfect to highlight and enhance the strawberry flavor. Funny, I thought this is how most red velvet cupcakes in the Philippines tastes like. Maybe it was because the vanilla frosting was actually made of cream cheese, that was a surprise for me. With most of the vanilla cupcakes I encounter here, the frosting is usually made of buttercream, so this was such a delight to eat. The chocolate frosting was to die for. It was very, very smooth and rich and tastes like Cadbury chocolates! Though I don't like chocolate on chocolate cupcakes, this was different mainly because of the quality of the frosting and the cranberries on top add a fresh twist! Our other observation is that given that the cupcakes were bought a day before, they were still very moist and fluffy! Props to the consistency of the chocolate cupcake base, too! It tasted the same for all variants, and through and through, the quality and texture stayed excellent. 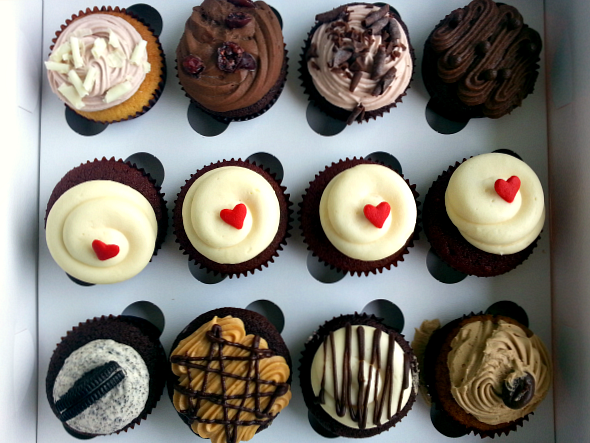 I think Twelve Cupcakes is reasonable for it's price (we paid around SGD 35, I think, for this dozen). If I have the opportunity to visit any of their shops in Singapore, I most certainly will! I will surely try all the other flavors available! Well, I wouldn't worry about that being too far away because Twelve Cupcake's official website announced that they will have a branch here in the Philippines soon! Yey! Click here for all their locations.